The stars are aligned, you found the perfect dress, but it needs some help to fit you like a glove. Well, in the bridal and formal wear industry who you have customizing your dress can really make or break your upcoming event. We always suggest that you use a seamstress who has the skills to work with the beading, exquisite fabrics, and custom pattern making. Our seamstresses have been trained by the best and have the capability to surpass your expectations. Don’t take a chance on an inexperience individual to possibility ruin your investment. Our in-house alterations department would love to put a smile on your face. Being able to listen to you desires and bring them into fruition is what they take pride in doing. So why drive around town looking for someone who understands your vision; when you can work with the in-store designers from start to finish. Choose from varieties of skills such as take in/let out dresses, sleeves, hems, spot cleaning, and making custom designer gowns. We can do more than just some restructured custom designs. We can also draw your design from scratch. Pick the best fabrics and beads to bring together a unique formal design. Keep in mind that we suggest that you get your dress altered at least a month before the wedding. This way you can have a second or third fitting if necessary. For custom design work we ask that you come several months in advance to your wedding. Our team is eager to help. 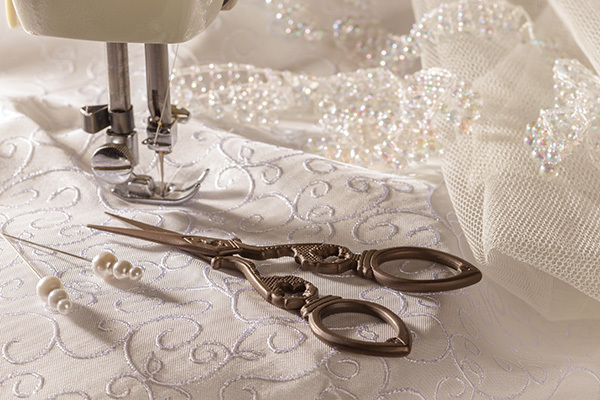 Come in and talk with a seamstress today! !